The following is an abridged translation of the biography of Mehmed Zahid Kotku Effendi,originally written in Turkish by his son-in-law, Professor Mahmud Esad Coşan. Khawaja Effendi’s family was among the Muslims who migrated to Bursa from the Caucuses in 1883. His ancestors were from Nuha (one of the capitals of the old Khanate). That city is now called Sheki and is situated in northern Azerbaijan. His mother, Sabire Hanim, passed away in 1900, in Bursa, and is buried in Pinarbashi cemetery there; Hocaefendi was left an orphan at the age of three. His father, Ibrahim Effendi, was a seyyid (a descendent of the Prophet [saw]). He came to Bursa at the age of 16. He completed his studies at the Hamza Bey Medresesi, and served as imam at various localities. 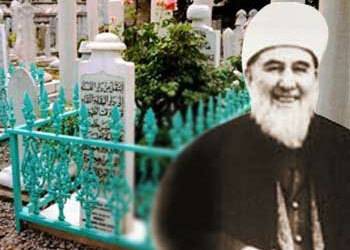 He passed away in 1929 at the age of 76 and was buried in the village of Izvat in Bursa. Khawaja Effendi was born in 1897 in Bursa. He completed his primary school education at Oruç Bey primary school. He attended the junior high school at Maksem for one year. Then he continued his schooling at Bursa Trade School. While there, the First World War broke out. He joined the army on April 14th, 1916. He served on various fronts for three years and faced many dangerous situations. On July 10th, 1919 he was transferred to continue his military service in Istanbul as a military clerk. While in Istanbul, he regularly attended various religious meetings, lectures, and sermons. Finally, on July 16th, 1920, after performing his Friday prayer at Hagia Sofia, he went to the tekke of Gümüşhaneli, next to Fatma Sultan mosque, across from the office of the governor of Istanbul. He joined the order there and took his duty lesson from sheikh Ömer Ziyaeddin Efendi. He made remarkable progress in his purification process. When his shaikh, Ömer Ziyaeddin Efendi, passed away on November 18th, 1921, he continued his lesson with the new teacher of the tekke, Mustafa Feyzi Efendi. He completed his seyr-i süluk (the spiritual process of achieving membership in a religious order) under the supervision of Mustafa Feyzi Effendi. After the closure and banning of all Sufi institutions by the law enacted on November 30th, 1925, Khawaja Effendi returned to Bursa, where he got married. When the post of imam at the village of Izvat in Bursa was vacated by the passing away of his father in 1929, he took over that post and lived there for about 16 years as the main imam of that village. In 1945, he was transferred to Uftade Mosque in the city of Bursa, where he served as its imam-khatib until 1952. After the demise of Abdulaziz Bekkine Efendi (the 38th member of the Noble Lineage) and upon the insistent requests of his followers, he accepted a transfer to Istanbul as the imam-khatib of the Çivizade mosque. During that assignment, he also served as the imam-khatib of the Ummü Gülsüm Masjid in Zeyrek-Istanbul. On October 1st 1958, he was transferred to the post of imam-khatib of Iskenderpaşa mosque, where he served until his death on November 13th, 1980. Mehmed Zahid Kotku Khawaja Effendi is the 39th member of the Noble Lineage (Spiritual Family Descent) starting with the Holy Prophet (pbuh.). Our late Khawaja Effendi was of above medium height and weight. His appearance was both imposing and inspiring. His skin was white and his cheeks were rosy. He had a rather large head with a wide and alabaster forehead. His eyebrows were widely spaced. At first glance, his eyes appeared to be chestnut in color, but in reality his eyes were so profound in essence and so mysterious in appearance that a close look was almost impossible. There were some red specks in his eyes and a palm-size birthmark on his back and abdomen. His outer appearance was solemn, pleasant, and delightful. His face was always brightened by a rosy smile. Onlookers could not help but develop a deep sense of respect and a warm affection towards him. He greeted everybody by salutation and dealt with each of them cheerfully and in a pleasant manner. He had an excellent memory, which enabled him to easily recall very fine details of past events and personalities. His conversations and talks were very pleasant and appealing. Most of the time, he used the dialect of the common people. He was an excellent and patient listener and never interrupted others while they spoke. When listening to others on subjects even very well known by him, he paid such close attention that it was possible to give the speaker the impression that Hocaefendi was hearing those things for the first time. His answers were full of meaning and niceties. When delivering the Friday khutba (official sermon delivered to the congregation from the podium in a mosque), the style of his address to the audience was awe-inspiring. He raised his voice considerably and talked extemporaneously to the audience, assuming the conciseness of an army commander addressing his troops. On all the issues he was interested in, he contemplated deeply and at length. It was impossible not to be filled with admiration for the resourcefulness and colorful comparisons he incorporated to his addresses and conversations. Sometimes he used to dwell on the interpretation of a single verse from the Qur’an for months. He was extremely modest and was never pretentious. Many examples can be given of this attitude. He lived among his followers as if he was one of them and let everybody have and maintain such an impression. He very carefully concealed his very high spiritual attainments. He was extremely respectful and bound to his teachers. His friends from the tekke used to tell how obedient and respectful he was in the presence of his masters. As a spiritual guide and teacher, he exercised extreme patience and tolerance in training and educating his pupils. He could work on an individual for years and never get tired or let him down. He was able to probe and gain spiritual access to a person’s heart. Most of the time, it was possible for one to get the answers to the questions in one’s heart without raising them verbally. He used to bestow the needs of the needy without being asked. He had a certain control and dominance on the dreams and the hearts of people. In family life, he was very affectionate and witty towards his household. He never ordered or asked for anything. In case of need, he preferred to express it through allusion, hint and allegory; and if not understood, he exercised patience. He was extremely faithful to his friends. He frequently visited them as well as inquired about and looked after them. He also strictly observed his duties and obligations towards his relatives. He was very generous, making unbelievably high donations. He was never afraid of being left without and always had guests and visitors for meals. He received them with a smiling face and pleasant manners and always left the door of his house open. He paid great attention to seeing to it that those serving him were fully content and happy. His attendance at evening and morning prayers and worships was extremely regular, urging his followers to do the same.